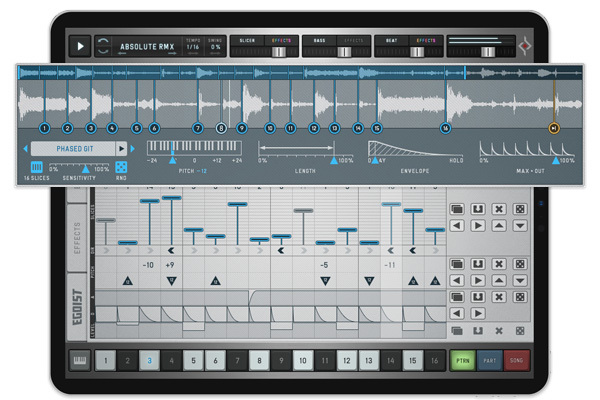 Egoist for iPad | Mobile Groove Box with Sample Slicer, Drum and Bass. Try your mp3 library and use it as a sound source! 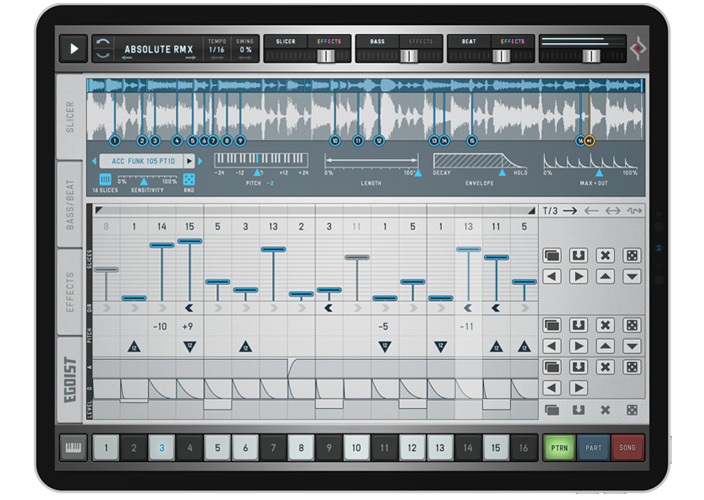 The additional onboard bass, beat and FX units make Egoist the perfect track sketch tool in the studio and on the road. Egoist balances lots of creative options with ease of use. A Case of the Whole being greater than the Sum of its parts. The Slicer with transient detection arranges up to 16 slices of the loaded sample. 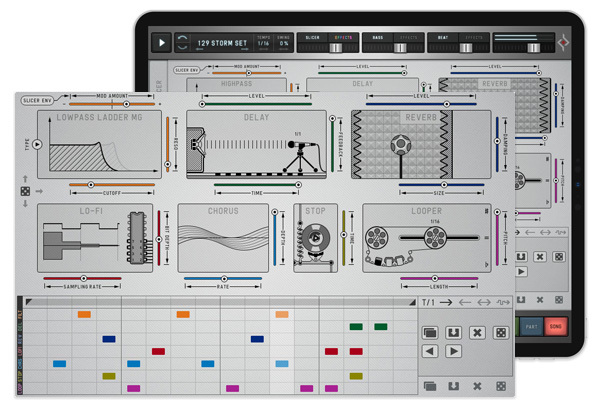 Apply different parameters like Reverse, Attack, Decay, Level and pitch with the sequencer. 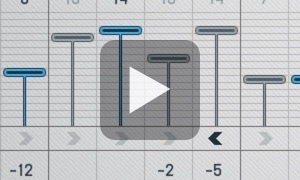 Using the 16 available patterns, up to 16 different samples can be used at any time. 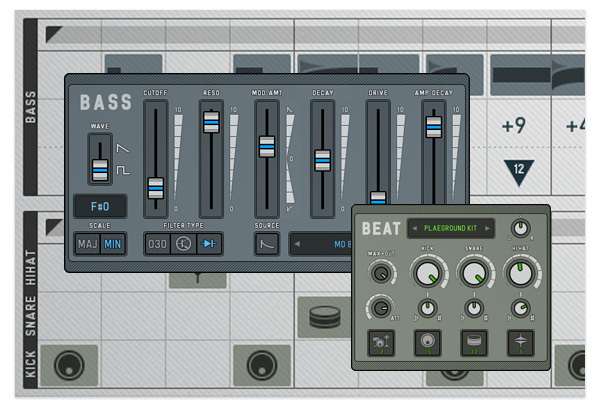 The internal Beat Box offers kick, snare and hihat, along with a simple sequencer. If you imagine, that you can change the drum sounds with each pattern, limitations start to get you inspired! The Effect unit brings funky hickups to your tracks. Engage tapestop, looper, reverb or filter at any time to give your beats that otherworldly feel and create stunning breaks! Egoist will seamlessly integrate with your mobile studio setup. Audiobus, IAA & Ableton Link are ready for action. The MIDI support with slave and master sync is rock solid and a whole new world will open up if you use Egoist in concert with your mobile DAW and other music-making apps. 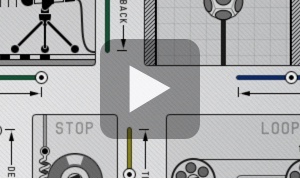 There is also a MIDI Learn option if you want to automate operation at some level. You can also trigger other instruments: there's a option to enable MIDI Out from the Bass Synth. 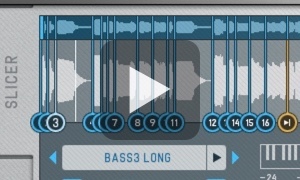 Mute the bass inside Egoist (it will still output MIDI), and then choose Egoist's MIDI channel in the receiving app. The very special Slice Keys turn Egoist into a slice keyboard! Play the sequencer steps on the keyboard, with all their settings and effects, you will not believe how cool that is! Chain your patterns! 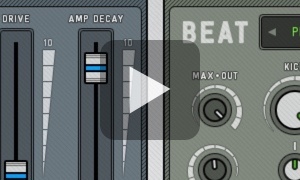 Or create stunning breakbeats by changing patterns quickly! The internal Part/Song sequencer lets you sketch your pattern progressions and line out your next track. The current update adds features to all four engines: all sequencers are polyrhythmic now with independent clock dividers, the slicer got a monophonic mode, we added scales to the bass, powerful mod sources to the filter and a Pan control for the HiHats!